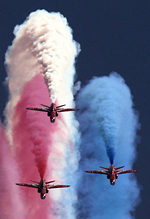 Was this the weekend that saw a seismic shift in the landscape of the British airshow? Waddington has long been England's premier Royal Air Force display, but has always played second fiddle to its big brother down in Gloucestershire - Fairford's Royal International Air Tattoo. But not in 2013. 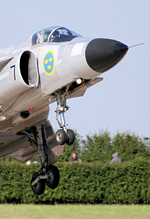 Helped doubtlessly by the inspired booking of the Swedish Air Force Historic Flight's SAAB Viggen - the hottest, and most must-see display item in Europe, and some pretty amazing weather, crowds of 145,000 piled through the gates in Lincolnshire. That, folks, is 15,000 more than attended RIAT in 2012. Did we witness a changing of the guard? UK Airshow Review's founder and webmaster Paul Osborne soaked up the sun (and the Swedes) at RAF Waddington. 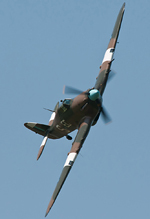 Waddington had already set the bar perilously high, with a well-received 2012 display. Despite cuts to military budgets the world over, could Waddington attract the star items to continue the trend, or even, dare we say, push the boundaries further? The forecast conditions for the weekend looked promising, with what has become an almost unseasonable spell of warm weather and blue skies taking the place of the drab overcast and frequently wet weather we've become accustomed to in recent 'summers'. Not surprisingly the public took full advantage and very quickly queues built up on the A15 northbound, resulting in tailbacks extending several miles causing people to enter the airfield several hours after the show had started. There did seem to be a lack of traffic control, especially the approaches to the airfield where side traffic wasn't being directed. As with Cosford a couple of weeks earlier, mixed messages had been eminating from official, and semi-official sources in the days preceding the show about ticket availability on the gate, and when the decision was made to only admit those with tickets - on the Saturday morning of the show, it was far too late for those already stuck in traffic, with no access to Twitter or the internet. The warm-up act always consists of a flypast by the Waddington based aircraft, namely the E-3 Sentry and Sentinel. Sadly the Nimrod R1 is no longer with us of course, but we can look forward to the arrival of RC-135s - which are to be horribly named 'Airseeker' in RAF service - taking part in the years to come as the fleet will be based at RAF Waddington. Starting off the show proper were the RAF Falcons, performing a full height display thanks to the almost cloudless sky. Their jump ship was a Cessna Caravan rather than a RAF C-130 of old. It makes no difference to the team what they jump from of course, but for the spectator it makes it harder to spot at jump height and the low flypast at the end isn't anywhere near as impressive. The first fast jet of the day and first of no less than three F-16 displays belonged to the Belgian Air Component. Usually the best F-16 display would be between the Belgians and Dutch but there's a new kid on the block - Solo Turk. Seen previously at RIAT 2011, the elegantly painted black, gold and grey F-16 put on a stunning display which was certainly comparable, if not better than its western European rivals. The finale was the deployment of the colour co-ordinated brake 'chute while the aircraft was still around 15-20ft off the runway! The Turkish commentator must certainly be on par with the legendary narrator of the Turkish Stars, full of enthusiasm, even if his English isn't exactly word-perfect. Classic British jet fans were catered for in the form of the Red Gnat display team. Currently displaying two Gnats, the North Weald based team hopes to eventually have four airframes available including Dave Gilmour's old Yellowjacks painted example. Hawker Hunter T7 G-FFOX flew on the Sunday only. Propeller based aerobatics came from Rod Dean in the Bulldog, the RAF Tucano and the Breitling sponsored Sbach 300 flown by competition aerobatic pilot Mikael Brageot. The Sbach is one of the current breed of aerobatic aircraft with masses of power that enable it to perform manoeuvres at seeming impossibly low airspeeds and it's certainly capable of amazing feats in the hands of experienced pilot Mika, despite being only in his mid 20s. 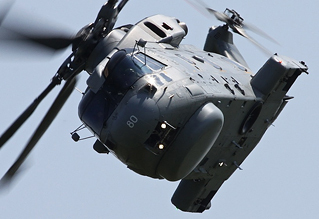 The Royal Navy were represented by the Merlin HM2, flying its first display, and the solo Lynx of the Black Cats. 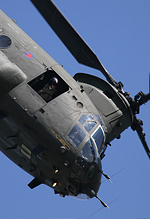 Impressive as always were the RAF Chinook and Army Air Corps Apache, both pleasantly photographable in such bright light instead of the silhouette appearance the dark olive drab scheme usually presents. 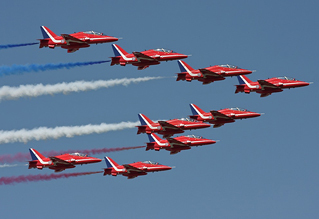 The Red Arrows are back this year with a full complement of nine aircraft after a difficult 2012 season. The cloudless skies above gave them the opportunity to do their full display, including the popular heart drawn in the sky with smoke, and I'm glad to say they're back on form. The French national display team the Patrouille France displayed equally well, albeit on the Saturday only. 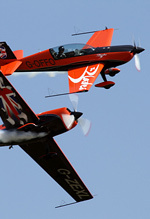 The Jordanian Falcons and the Blades showed team aerobatics at the other end of the spectrum. The sell-out crowds were no doubt helped in part by the appearance of Vulcan XH558. Impressive as it may be to the newer generation of airshow viewers, I can't help but compare the current display to the RAF days where it seems tame in comparison. This is all down to limiting the stress on the aircraft to extend the display life as long as possible. There are plans to extend the life until the end of the 2015 season with wing modifications, but as usual it all boils down to money. Saturday's Pilot Bil Ramsey (in mitigation, this was his first official public display) did, however, manage some cracking wingovers which seemed to be well in excess of 90 degrees. As he taxied back in there was the photo opportunity to capture two Vulcans in a single frame, as XH558 passed in front of XM607 parked on the far side of the airfield. 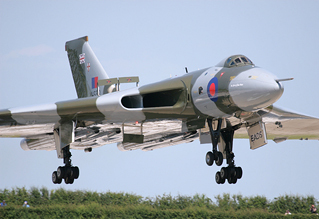 607 is of course another mount familiar to Vulcan To The Sky Trust pilot Martin Withers', who flew that very aircraft for the Black Buck raids during the Falklands war. 2013 sees the 70th anniversary of the Dambusters raid and this was marked by a formation flypast of the BBMF's Lancaster and specially marked Tornado of 617 Squadron. Another unique formation was that of the Sentinel (again, wearing special tail markings) and Red Arrows to commemorate 100 years of V (AC) Squadron. 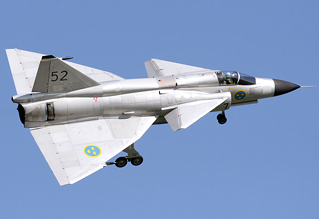 For many though, the undoubted star item(s) at the show were the aircraft of the Swedish Air Force Historic Flight. First to taxi out was the Sk 60 trainer, a type that is certainly no stranger to UK airshows. Unfortunately, it wasn't joined by either of it's stablemates, as show commentator Ben Dunnell announced that bad news that both the Viggen and Tunnan had problems and therefore weren't to display, the Viggen returning to parking having already begun to taxi when a fault occured. This news drew audible groans and even lead some people to pack up and depart. After the Sk 60 had displayed the crowd were updated on the situation, with the slightly better news that it was hoped to get both the Tunnan and Viggen fit and ready again before the Patrouille de France display closed the show. 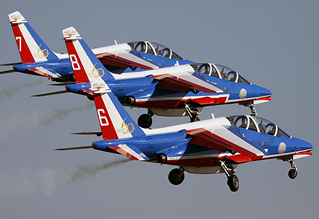 The resulting gap was ably filled by bringing forward the displays from the Czech L-159 and Dutch F-16. Thankfully the gremlins with both of the remaining Swedish aircraft were solved and the mighty Viggen took to the air in a very short distance. Stellan Andersson put on a marvellous display in the only flying example of the type remaining, bringing back memories of the type's heyday when it was displayed in Swedish Air Force service. The bare aluminium finish and distinctive double delta plan form shone in the late afternoon sun with some lovely topside views. The landing was as impressively short as the launch was, thanks to the thrust reverser - a requirement of being able to operate from public roads. The final item from the Swedes was the J 29 Tunnan - another sole survivor in airworthy condition and a type that had never before flown at an English air display! It's an odd looking aircraft, the front section being reminiscent of the F-86 Sabre, but the pilot put on a great display, although we could have done with more topside views of this very rare vintage jet. The static park was an awful lot thinner this year than last, while still having the odd gem in among the more common aircraft. United States participation is never that great at Waddington so the lack of American assets to air displays didn't really prove to be a problem. Highlights would include QinetiQ's RJ100, Piaggio P166 and one of the very last chances to see the VC-10 before retirement later this year. When compared to the shows of old, 2013 might not have been a classic year but it certainly wasn't a bad one - at least by modern standards. The weather undoubtedly helped, there was plenty of variety, from fast jets and helicopters to a smattering of historic aircraft and display teams with few gaps. The Waddington team deserve enormous credit for having the intuition to book the Viggen, though UKAR understands it did cost the proverbial arm, and possibly several legs, but it clearly shows that booking rare items will draw in the crowds! The main let down for the majority would have been the traffic situation; many on the UKAR forums were stuck either getting in or getting out. This MUST be improved for next year, especially if, as in 2013 the crowds continue to keep on flocking to this event. Waddington has shown it can think big, and be big - let this be a lesson to other shows this season, and beyond.